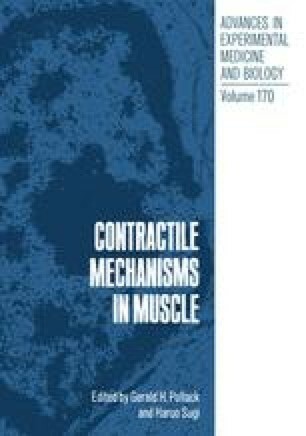 The following papers are all concerned with the conformational changes which occur in myosin cross-bridges during contraction. A number of studies have established that the force of muscle contraction is generated by a cyclic interaction in which the heads of the myosin molecule attach to sites on the thin filament and subsequently exert a force on the thin filament which translates it by approximately 10 nm towards the center of the sarcomere. However, the nature of the changes in the conformation of the actomyosin complex, which are responsible for force generation, remain unknown. The initial indication that these conformational changes may involve an alteration in the angle of the myosin cross-bridge came from electron micrographs of thin sections of insect flight muscle. Both electron micrographs and small angle X-ray diffraction patterns suggested that in rigor muscle the cross-bridges were attached to the actin filaments in an angled configuration while in relaxed muscle they assumed a different configuration and did not interact strongly with the actin. In contracting muscle the X-ray diffraction patterns indicated that the cross-bridges were considerably disordered. These early studies, which helped establish the moving cross-bridge hypothesis, have now been extended considerably by new X-ray techniques and these recent developments are discussed by Dr. H.E. Huxley in an earlier session, and by Dr. K. Holmes in this session.